“The only real prerequisite to becoming a good investor is committing the time to educate yourself. Regular people have the ability to become outstanding investors in their own right. -Matthew Schifrin, Vice President at Forbes Media LLC and Author of ‘The Warren Buffets Next door’. In 2000, 5 million online traders, by 2010, 50 million trading online in America alone. In South Africa, we are only starting to become aware and part of this trend. 55% of Australian adults have a trading or broking account! Anyone can acquire knowledge and trade successfully. We keep it simple, real and rewarding! Yes, not in 3 months, BUT, with discipline, a strategy and patience, the miracle of compound interest can ensure financial independence. We all know how quickly debt interest can compound. This opportunity compounds income! Myth #3: You Need Large Amounts of Money to Trade. An excellent vehicle for short term trading strategies accessible to ordinary people. Myth #4: You Need to Spend Hours Researching and Staring at Your Laptop. 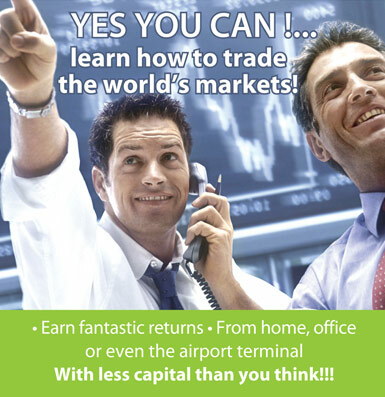 An hour to two a day is all it takes and the world markets are accessible24/5. You trade when it suits you! We Provide the Training to Unlock your Wealth Potential! With Discipline, a Strategy and Patience, the Miracle of Compound Interest can Ensure Financial Independence! *Internet connection and PC Required. Solid Ground Trading does not offer an advisory or fund management service, rather provides training based on principles of integrity and sustainability thereby ensuring clients are holistically educated and supported towards trading success. Risk Warning: Trading does carry risk, CFD’S are geared or leveraged and can lead to large losses as well as gains, you should be aware of the implications of margin trading before you enter into any trades.